James B. Hunt, who held the office of Governor for the state of North Carolina in the spot of 69th and 71st has an institute named after him (the Hunt Institute Tweets) – and now a library. He established his legacy in the state for emphasizing and promoting education. Now, North Carolina State University has named the newest addition to their collection of libraries after him. The building is in-construction currently, but the design plans exhibited thus far have this image as its future. I am not an architect, obviously, but I just want to draw attention to this new library being built in the United States on the east coast because North Carolina State University is known for being an engineering school made of red bricks as far as one can see. 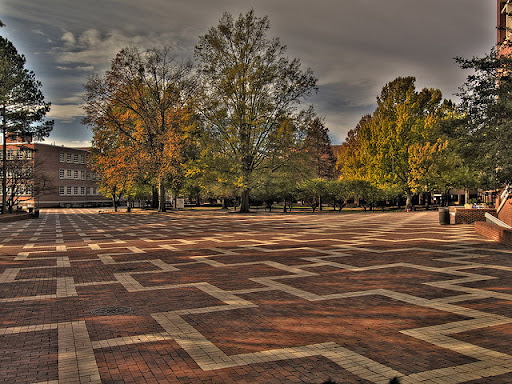 The campus even has a brick-yard in a place used daily by thousands of students year-after-year. Image from here. And this library is something different. A Norwegian architectural firm named Snøhetta won the contract (or whatever method was used to get the right deal for the University). And a good thing too. The influence of Scandinavian architecture added to the NCSU Centennial Campus is only beneficial because it breaks up the aesthetic of that campus quite well. Plus, it looks from what I could see from outside the construction site and from the officially released images that this library will let in a lot of natural light. The history of libraries has seen a lot of metaphors of light tossed about. Why not? But this does not contradict the stated purpose of this library building. The James B. Hunt Library has plans to be the “best learning and collaborative space in the country.” Obviously, this library’s impact will be felt most directly by the NCSU community, but maybe I too will get a chance to do some research inside its well designed walls. Just wanted to let the library world know about this one while it’s in-progress. PS: There are a few good food joints in the area of the library as well as coffee (which every library researcher needs). Thoughts or Comments on the Library are welcome. This entry was posted in architecture, library, library design.